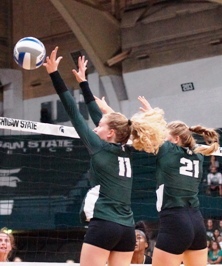 The Spartans will host a six-team spring tournament in Jenison Field House starting at 9:00 a.m. on Saturday, March 30, 2019. Teams will include Bowling Green, Ferris State, Notre Dame, Oakland, and Toledo. MSU's first match is scheduled for 10 a.m. See the tentative schedule below. The SideOut Club’s Annual Meeting will be held on March 30, 2019 in room 300 of Jenison Field House, during the spring tournament. It will start at about noon, during a break in the schedule just after the 11 a.m. match. All members are encouraged to attend. The Club’s annual financial statement will be presented and there will be an election for the Board of Directors. The Annual Meeting also serves as a forum for members to voice any suggestions or concerns. Hope to see you all on the 30th. Eileen Ellis, vice-president of the SideOut Club, announced the Club's donation of $9,000 for use by the volleyball program. The 2018 fall schedule begins August 18 with the traditional Green vs. White exhibition match at 4:00 p.m., with free admission for all. Then the team will take to the road for three weekends, before returning to host their home opener with the Auto-Owners Insurance Spartan Invitational Sept. 14-15 at Jenison Field House. The pre-conference schedule is less challenging than in some previous years, giving the lineup of mostly young, new starters some time to gain experience. The AVCA preseason poll of coaches has the Spartan volleyball team ranked number 22 in the country. As expected, this is down from the final ranking of number 8 for the 2017 season, after the graduation of most of last year's starters. The Big Ten preseason poll puts MSU at ninth in the Big Ten after their fourth-place finish in 2017. Kristin Kelsay Among "Thirty Under 30"
The Spartan volleyball team has a reduced schedule for spring 2018. They will start March 30 at Central Michigan University matched up against Ferris State and the host Chippewas. A week later they travel to Louisville, KY for the Kiva tournament on April 7. They return home to wrap up the spring season hosting Eastern Michigan on April 14. For news from previous years, click on "Archive" in the top menu. 2018 sees a number of coaches switching schools, yet remaining within the Big Ten. The NCAA has announced rules changes for women's volleyball, to take effect for the fall 2018 season. They are all procedural changes, so fans will not notice any changes in the play of the game. Probably the most noticeable change will be the shortening of the mid-match intermission from ten minutes to only five, "to improve pace of play". In the challenge review system, in/out calls and touches will be combined into a single challenge, three-meter-line attack violations will be challengeable, and teams will be granted a fourth available challenge when a match goes into a fifth set.